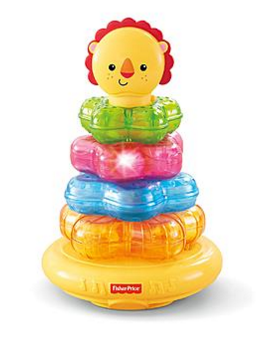 Fisher-Price Light-Up Lion Stacker Just $8.50! Down From $17.99! You are here: Home / Great Deals / Fisher-Price Light-Up Lion Stacker Just $8.50! Down From $17.99! Sears has this Fisher-Price Light-Up Lion Stacker on sale for $8.50 (Reg. $17.99)! The Light-Up Lion Stacker brings a friendly character themed twist to a proven play format for baby! Featuring 4 colorful translucent rings, each with molded detail and texture, a bat-at wobbly base, and a friendly lion character top.